Firms’ technological distinctive competencies (TDCs) help CEOs to confront their reality based on technological knowledge to achieve and exploit competitive advantage by encouraging the different dimensions of corporate entrepreneurship (innovation, new business venturing, proactiveness and self-renewal). 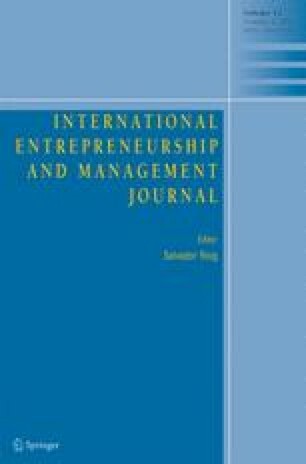 The main purpose of this paper is thus to highlight how companies that strive to improve technological competencies within the firm achieve higher organizational performance through different components of corporate entrepreneurship and their interrelationships. This study seeks to fill this research gap by analyzing theoretically and empirically how TDCs enhance innovation, new business venturing and proactiveness and their interrelationships to achieve self-renewal and thus improve firms’ organizational performance. The methodology used is LISREL analysis. We test the model with data from 201 Spanish organizations. Our research contributes theoretical and empirical arguments on the value of TDCs to the organization, arguments that are especially important because organizations sometimes fail to achieve sustainable competitive advantage due to their limited understanding of the relationships between these strategic variables. Capability to obtain information about the status and the progress of science and relevant technologies and advanced technological processes. Capability to assimilate new technologies and useful innovations. Capability to attract and retain qualified scientific-technical staff. Capability to dominate, generate or absorb basic and key business technologies. The emphasis on developing new products/services. The rate of new product/service introduction into the market. Spending on new product/service development activities. The number of products/services added by the organization and already existing in the market. The number of new products/services introduced in the market for the first time by the organization. Percentage of revenue generated from new businesses/services that did not exist three years ago. The organization has stimulated new demands for existing products/services in currents markets through aggressive advertising and marketing. The organization has broadened the business lines in current industries. The organization has pursued new business in new industries related to its current business. The organization has found new niches for its products/services in current markets. The organization has entered new businesses by offering new lines and products/services. In dealing with competitors, the organization is very often the first business to introduce new products/services, administrative techniques, operating technologies, etc. In dealing with competitors, our organization typically adopts a very competitive, undo-the-competitors posture. In general, the top managers at our firm have a strong propensity for high-risk projects (with chances of very high returns). In general, the top managers at our firm believe that, owing to the nature of the environment, bold, wide-ranging actions are necessary to achieve the firm’s objectives. When confronted with decision-making situations involving uncertainty, our organization typically adopts a bold, aggressive posture in order to maximize the probability of exploiting potential opportunities. The organization has revised the business concept. The organization has redefined the industries in which the company will compete. The organization has reorganized units and divisions to increase organizational innovation. The organization has coordinated activities among units to enhance organizational innovation. The organization has increased the autonomy (independence) of different units to enhance their innovation. The organization has adopted flexible organizational structures to increase innovation. The organization has rewarded employees for creativity and innovation. The organization has trained and encouraged employees to be creative and innovative. Relative to your main competitors, what is your firm’s performance in the last three years in the following areas? Organizational performance measured by return on assets (economic profitability or ROA). Organizational performance measured by return on equity (financial profitability or ROE). Organizational performance measured by return on sales (percentage of profits over billing volume). Organization’s market share in its main products and markets. Growth of sales in its main products and markets.